Reminder note to myself. God, I hate Peggy Noonan. It was a five-minute drunken lecture that seemed like five hours. (Oxycontin? Ludes? Jack Daniels? All three?) Her lamenting the seriousness of the Democratic presidential candidates and drawing false comparisons between the phony baloney "far left and the far right." Something like: since the President is unfit for office, Gillibrand should not announce her candidacy on Colbert in a "flirty way." As if Gillibrand's announcement was the same as Trump descending the escalator and announcing that Mexicans are rapists. 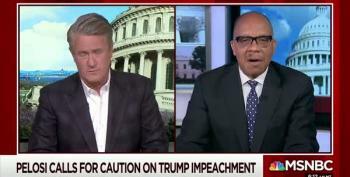 Then I grabbed the Morning Joe clip and watched. Wow, he's right. PEGGY NOONAN: I mean, I saw Kristen Gillibrand announce with Colbert. She kind of flirted with him and took his hand and they giggled together and I said wow, this is not the announcement of a sitcom, this is the announcement for the presidency. Shouldn't we be serious? Donald Trump is not a serious man when it comes to issues. I would think if you're running against him you would underline your seriousness and capability and accomplishments and leave the charm and the likeability and the relatability for later. [At] this point early on is where somebody said the other day, this is where the grifters, weirdos and people desperate for attention tend to come into the campaign, because you can get attention at first. I don't mean those who have come forward are that. ...I think we'll be seeing some characters coming down the line. At which point Mike Huckabee, Herman Cain, and Carly Fiorina changed the channel.